Home Archives Color Keyword Search: Who Passed With Flying Colors? 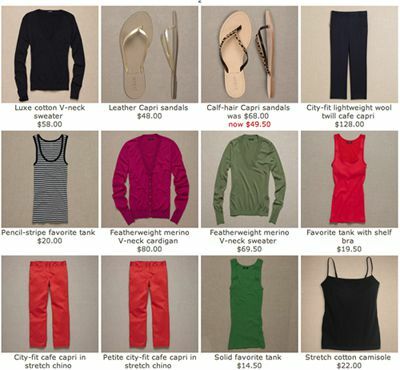 Continuing the series on site search usability, I decided to test out color-specific searches on a number of apparel etailers from my favorite list of top etailers of 2006. 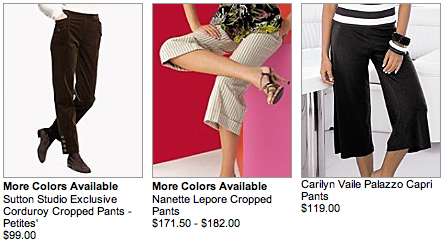 I wanted to compare the results for “black capris” across the board of etailers and see what I would discover. (I did find one error in Blair.com’s results. Perhaps the color was sold out and the search engine was still reading old meta data). Nordstrom “passed” but also delivered a L.A.M.B bag called “Love Capri” and a men’s shoe style named “Capri.” Which is fine, it is just indicative that it will match keywords to more than just one category. Liz Claiborne failed for “black capris” so I tried just “capris.” Interestingly enough, LC really didn’t carry any black capris! 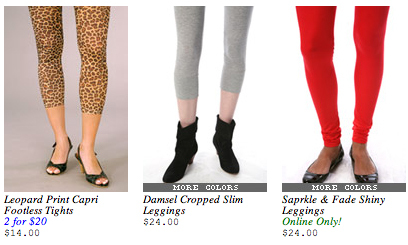 I searched for a color it did carry, “mocha capris” and search still failed. Gap and Abercrombie and Fitch did not even have search boxes at all, which is generally not recommended for ecommerce sites, as you leave users to the browse menu, and we know that many users prefer search to browse mode, and browsing navigation systems have their limitations. Because they are well known brands they may not lose sales to other stores out of user frustration — but most ecommerce sites don’t have that luxury. None of the etailers delivered only color-specific thumbnails, a functionality that EasyAsk claims to provide for clients Talbot’s and J.Jill by loading a photo in each color for each product and programming the search engine to pick up on color keywords. Though not as important for black, it would be a nice feature to be able to see “green blouses” at a glance, for example, and be able to click on only the hues of green you like without having to click through each individual product. This capability can’t be too far off, as sites like Etsy and Shopwiki are already providing visual search goodies like this.